Here’s a great way to build your professional reputation by inspiring confidence in your work among your customers. 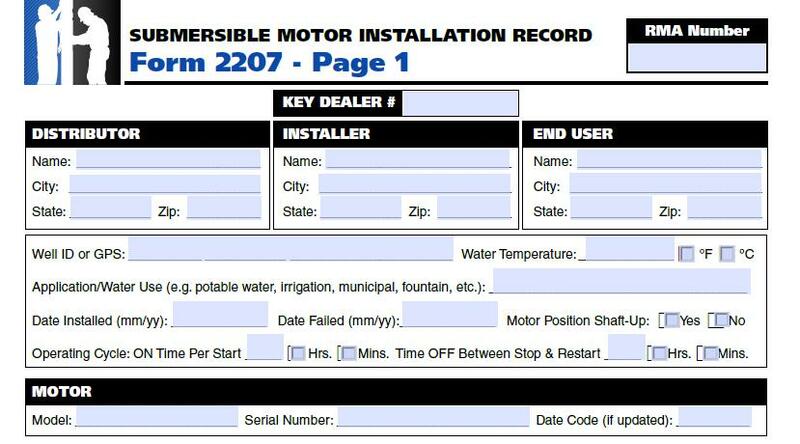 For each and every installation, whether it’s a new one or a service call, complete a Franklin Electric 2207 Form – Submersible Motor Installation Record. Then, hand your customer a copy of it with your business card attached. A completed 2207 contains all the details of a submersible installation. In an instant, you’ve demonstrated that you haven’t just replaced or installed something, but that you’ve taken the time to analyze and understand his water system needs and which products are best suited for it. Granted, your customer may not understand everything on the form, but it doesn’t matter. The point is that it conveys your competence and professionalism. Besides, you can always take the time to explain it more, further highlighting your expertise. There are other benefits to a completed 2207, as well. On some Franklin products, if a warranty is later required, Franklin Electric will ask for a copy of the installation’s 2207. But even if a warranty isn’t ever involved, you still have a permanent record of that installation’s specifics. So, if the customer calls with an issue 5 years later, you already know most of the details. Now you can focus on what changed in the installation. There’s a 2207 in every Franklin Electric AIM Manual. It’s near the middle, and it’s perfectly okay to make and use as many copies of that as you need. For an electronic copy, go to the Franklin website, where you can download a PDF version. That PDF is “interactive”. That is, you can either print out a blank copy or actually complete the 2207 on your computer. Finally, at first glance, the 2207 form probably looks more complicated that it really is. That’s because it’s designed to cover all installations; for any specific installation, you probably won’t need to fill out the entire form. You’ll know which fields are relevant to your site as soon as you dive into it. By investing a few minutes to complete and provide a 2207, you’ll not only do yourself a favor, but leave a positive, lasting impression on your customer. My bet is that when that system needs service down the road, he will pull out that 2207 and call you, not someone else. This entry was posted in Business Tip and tagged Franklin Electric 2207 Form, Submersible Motor Installation Record by markreeder. Bookmark the permalink. Hola! I’ve been reading your blog for a while now and finally got the bravery to go ahead and give you a shout out from Kingwood Tx! Just wanted to tell you keep up the fantastic job! Your own post provides verified helpful to us. It’s really helpful and you’re simply obviously really experienced of this type. You have got opened our sight to various opinion of this kind of subject matter with intriguing, notable and solid articles. mortgage-related bonds. None Of Us Is Above The Law: Police officers are not above the law. The children were beaten daily with the same plumbing tube. the first amenities providers & their service specialties. as well as basin wrenches for tightening nuts and other items that you don’t want marred by the pipe wrench. me. Anyways, I’m certainly pleased I found it and I’ll be book-marking it and checking back frequently!